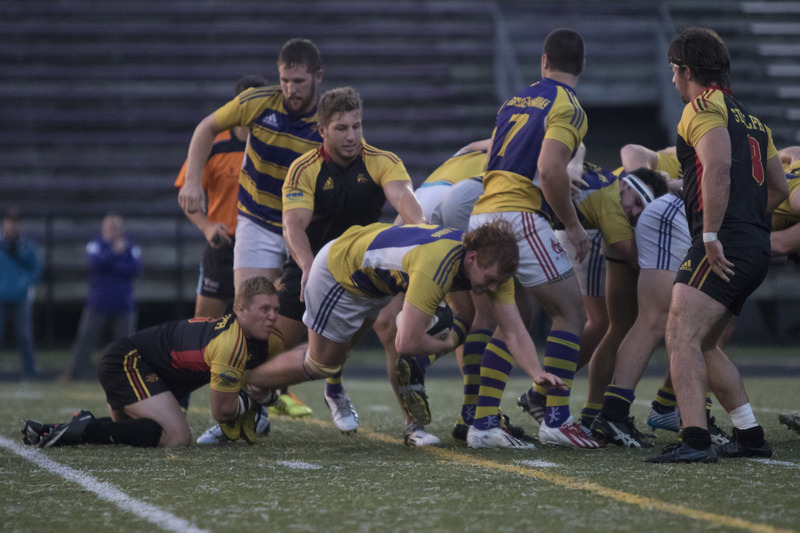 The Wilfrid Laurier Golden Hawks men’s rugby team suffered a tough loss when they faced off against Western In the first round of the Ontario University Athletics playoffs. The game resulted in a 67-26 defeat for the Hawks. However one sided the final score, it was a competitive game through to the last push by Western to break it open, according to head coach Ian McLeod. In that 20 minute span, the game came within reach thanks in part to a couple of tries by eight-man Andrew Thompson and a few conversions by Maclain Wakefield. The closest Laurier came to righting the ship was a 10-point difference. But Western came out of the gate fast and the Laurier team lagged their response until the second half. Following this, the game was broken open by Western and the game quickly slipped away. “The last 20 minutes we just ran out of gas, they really ran it up on us in the last 20 minutes. So overall we played a good 20 minutes out of an 80-minute game and that’s not going to do the job,” said coach McLeod. “They inserted their subs at [the second half of the game], so they had eight fresh players on the field,” he said. After a dismal four-season drought that ended without a post-season appearance for the Hawks, this is the second consecutive year Laurier has made the playoffs, which leads to much promise for the program going forward. According to McLeod, Laurier has a lot of promise as the program continues to get older and more mature. “Physically and mentally, we’re going to be a program to be reckoned with,” he said. According to McLeod, the program is still in a building stage and with it being the second year the program has made the playoffs, that is a positive. The Laurier coach touches upon the necessities of recruiting to grow the program and make the final pushes needed to be a top contender. Under the McLeod-led coaching regime, playoffs are now a bench mark to be built upon for next season. “We’ll continue to recruit the better ball players and we’ll get to ideally where we want to go which is the gold medal game,” said McLeod.